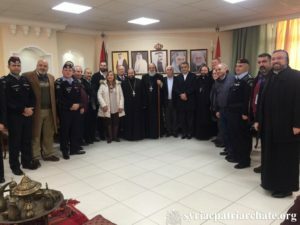 On January 18, 2019, His Holiness Patriarch Mor Ignatius Aphrem II was received at the Jordanian Borders, for the First Apostolic Visit to the Syriac Orthodox Church there. Very Rev. Raban Benyamen Chamoun, Parish Priest in Jordan, as well as a number of officials, received His Holiness. The delegation accompanying His Holiness consists of: His Eminence Mor Timotheos Matta Al-Khoury, Patriarchal Vicar in the Patriarchal Archdiocese of Damascus, Very Rev. Raban Joseph Bali, Patriarchal Secretary and Media Office Director, Very Rev. Raban Jack Yakoub, Director of the Suryoyo Patriarchal Youth Department, and Very Rev. Raban Barsoum Kindo.